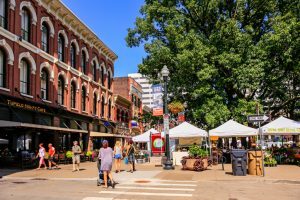 There’s a move afoot in Knoxville, Tenn., to both make the city greener and help small businesses succeed. Last week, the conversation turned to parking. The city council voted to update its parking ordinance on first reading, to reduce parking space minimums required in commercial areas, cap the maximum number of allowed spaces, and beef up existing parking lot landscaping. New parking lots will follow landscaping requirements as well, including installing tree islands (the council is still debating how many will be required). The ordinance is up for a second reading and final approval at the end of September. City planners, who spent two years working on the changes, say they’ll make the city greener, which makes parking more pleasant, and release small businesses from onerous parking minimum requirements.